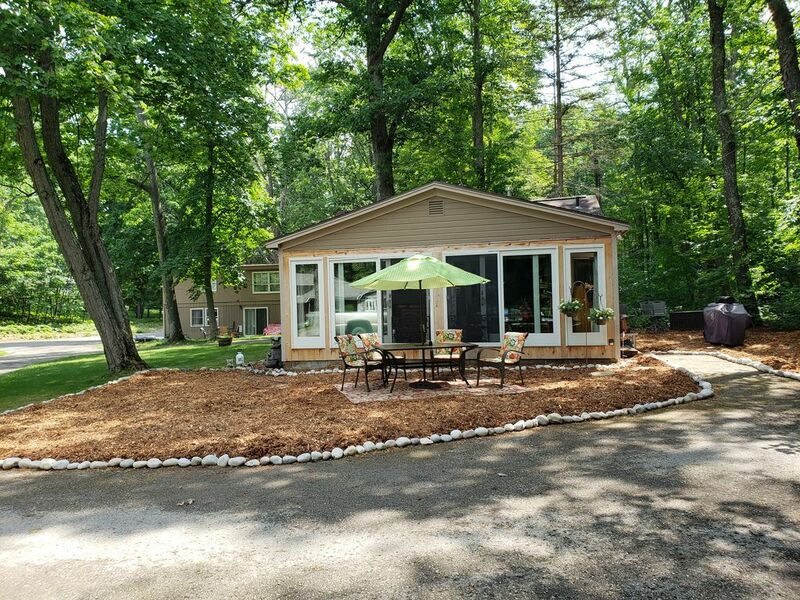 Perfect Summer Family Vacation Cottage on Long Lake Near Traverse City! Beautiful Long Lake is one of Northwest Lower Michigan's best fishing and all-sports lakes. It is five miles long with sandy shores and five islands. 2 Bedroom cottage located only 10 mi. from downtown Traverse City between TC and Interlochen. This is a weekly rental *ONLY* rental is from Saturday to Saturday. Birchwood Cove, offers a perfect spot for a family vacation in a park-like setting with mature oak, beech, and pine trees, a maintained lawn that goes all the way down to the beach and a quiet, private setting. The cove is a beautiful spot for relaxing and enjoying the sights and sounds of the lake and wildlife. Every year we enjoy a pair of nesting loons, frogs, fish and turtles, cranes/herons flying across the lake and silhouetted in the sun-set, eagles, hawks and deer. There are numerous restaurants in the region, many within a few miles. Interlochen Arts Academy is 5 miles south of the resort. Many new updates for 2017 include a new dock, new tile flooring in the dining room and kitchen, new countertop, new kitchen sink and faucet, new air conditioning, new windows, new tile & wood flooring! The cottage can sleep 4 people, with two bedrooms. Beach amenities include fire-pit, dock, swim raft, row boat, shallow sandy beach in quiet cove. You may bring 1 boat and tie it to the dock. The beach front is shared between all rentals. The cabin has a gas grill and picnic table. The kitchen is fully-equipped including microwave and coffee pot. Linens and towels NOT included. row boat, canoe, life jackets, oars, anchor, raft, fire-pit, picnic table, circle drive, park-like setting, 700' driveway, away from road.